Hi guys! Hope you all had a great weekend. I couldn’t wait to begin another new week with you. This week starts on a different note from the past three weeks … my heart is peaceful and calm. The weekend was full of hard work physically, and much to take in intellectually as well. I am amazed at how quickly our bodies can adjust. The first two weekends when I got home on both Saturday and Sunday, I was completely spent. But not this weekend, both nights I came home energized. It felt great, and I was delighted with the change. This 62-year old body does seem to be rising to the challenge, and I am so thankful. This weekend I had no emotional breakdowns, and I pretty much sailed through the days. My mom was eerily quiet on my drives through the canyon. Makes me wonder if my realization last weekend has quieted her soul as well as mine. I have to say, and she would love this, I kind of missed her company on the drive. Our weekend was filled with the physical aspects of yoga, but also the spiritual elements. I continue to be amazed at how much there is to learn about yoga. One could spend a lifetime, truly. And I must say, I’m beginning to think I may do just that, spend the rest of my lifetime learning more about this discipline. Our studies this week center around tapas. (And no, not the great little appetizers that are so popular these days.) Tapas literally means to heat or burn. One element of the teaching is that through mental tapas, you burn your old habitual impressions. Through verbal tapas, you step outside of your communication comfort zone and have difficult conversations with yourself and others. We were each asked to make a list of feelings or habitual thoughts that no longer serve us. It could be anger or resentment toward an old friend, sorrow or guilt over a lost love, any feelings that we have harbored that have kept us down. We could bring a picture or just write it on a slip of paper, and on Sunday morning we visited a little historical bed and breakfast place in Auburn. They permitted us to use their little fire pit. We gathered around our ceremonial fire pit and each cast our thoughts to the fire. I remember doing something like this when I was much younger, and I have to say, it may sound a little hokey, but there’s something to it. The physical act adds a component to the process that is hard to put into words. They say that actually writing out your ideas, plans, thoughts, etc., changes your brain, and makes your chances higher of actually achieving your goals. I would have to think this is the same concept. It’s taking your thoughts and making them physical, with more power. Interesting note, I didn’t feel the need to write anything about either of my parents. I made my choices carefully and off to the fire they went. The remainder of the weekend, I put my energies into the physical aspects of what we were learning on the mat. I was so happy that yesterday was a holiday, so nice after coming off of the challenging weekend. I started my day with a walk in the brisk morning light. It was a cold day in Cool. 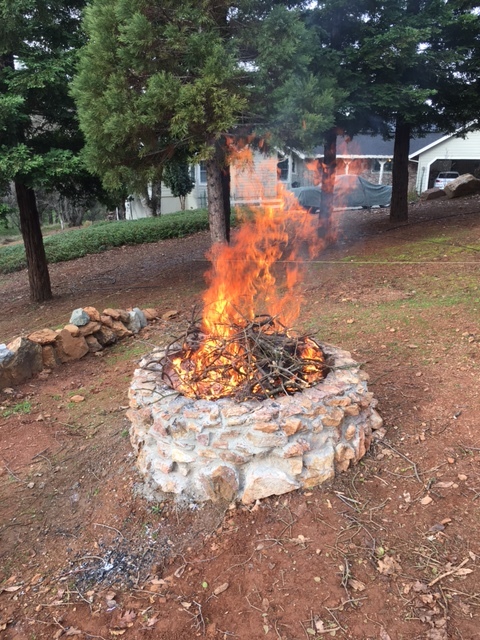 When I got back, I decided to start a fire in our firepit out front. Remembering that I had some old checks of my mom’s that I wanted to burn, I thought to run in and grab them. I decided as I was walking toward the fire with her checks in hand, to make an intention with my burning, even though I still did not feel a need. Quiet heart … finally. But I thought it couldn’t hurt. As the checks were all but engulfed in flames, a cloud moved from blocking the sun, and suddenly the heat from the sun on this cold winter day made its presence known. It made me wonder? But what turned my wonder into believing, was that as I was standing there enjoying the warmth on my face, I noticed something falling from the sky, in a direction coming from over my shoulder. I thought to myself, that looks like snow, but it couldn’t be. Must be something falling from the trees. (I absolutely LOVE snow, and when it snows in Cool, which isn’t very often, I am one happy girl.) As I turned to look up, I found that they were indeed tiny snowflakes drifting from a cloud behind me while the sun still warmed my face. Magical moments on this path. This week I find myself in complete awe. This is an amazing life we lead, with endless possibilities presenting themselves to us every day. I am so grateful I found the courage to try this. I have a lot more I’m looking forward to sharing with you this week. As I sit to write this post, Rick is watching “Field of Dreams”. Amazing movie, one I’ve watched at least ten plus times, and I never seem to tire of the story line, the idea that we can heal across years/across generations/beyond what we know as this lifetime. Like I said in my last post, life is but a dream. How many people would line up on that road to the field of dreams if they could heal the sorrows they still harbor for their departed loved ones? I would think, just like the movie depicts, headlights as far as the eye can see. I’m a strong supporter of the notion that in this lifetime, we see life through our earthly limitations, but that the best part of the story is something which unfortunately from our view, we can’t quite yet see. I don’t think, though, that that precludes us doing the work we need to do in this lifetime to heal, even if our loved ones have left, or even if your loved one lived two or three generations before you and has left a legacy which affects your life negatively. We just need faith, and I know sometimes it’s hard to muster up, but so worth it when you can … faith in something larger than ourselves, and a faith in goodness. I won’t put a label on that faith, that’s up to the reader. But in my humble opinion, ALL of those faiths add up to the same thing, and we need only visit the oceanside, the mountains, our streams and rivers, or look to the skies to know that this beauty is not random. It repeats itself over and over and over again as far back as anything that we humans have been able to record. Why would we not trust that? Like in Field of Dreams, or my story with my mom, in most cases what we all struggle with is forgiveness. Hard to give, maybe even harder to receive, as we are always harder on ourselves than others. But regardless of which direction it’s going, forgiveness can probably rival any medication on the market with its healing properties. I would urge you to try the tapas idea. (not the dinner, well, maybe that too) But just take a peak inside to see what maybe you can toss out. We just don’t need that old baggage in our hearts. And then try making the tossing an actual physical exercise. It can be throwing stones in a lake or river, or the ocean, or burning if you’ve got a fireplace or fire pit, anything which actually puts your desire into a physical form. It has power. And let me know if you do try it, what you think. To close this post, I will share what I hope my mom knows, wherever she is… that she left behind some amazing souls to take care of her girl. My children continually blur the lines for me between parent and child because the love they offer back to me on a daily basis mirrors what I feel for them. Amazing. And although my mom had her doubts about my second husband, in her final days she did come to know who Rick was, as he helped her through some of her hardest days in the hospital. I’m glad she got a glimpse of who he truly is. I hear the “careful driving.” And then I wait for “watch out for the critters.” It makes me smile. It makes me feel loved. As I drove to class Sunday morning on the windy road through the canyon long before the sun would rise, even without my mom, it was nice to know that I’ve got another spirit keeping an eye out for me, as well as the deer. Social media is full of the stories that from the outside look so amazing. Much of what we see is a false representation. Turn a blind eye to the glitz and look to your story and your glory. It’s probably pretty simple and ever so lovely. It’s just a story of love, and it can be a romantic love, but doesn’t need to be. It’s your story, and it’s the kind of story that keeps you coming back. Celebrate your life this week, and try letting go of something, no matter how small it is. Life is short. The lighter our load, the farther we can climb. So many lessons, so much more to tell … next post. Thanks for warming my heart!